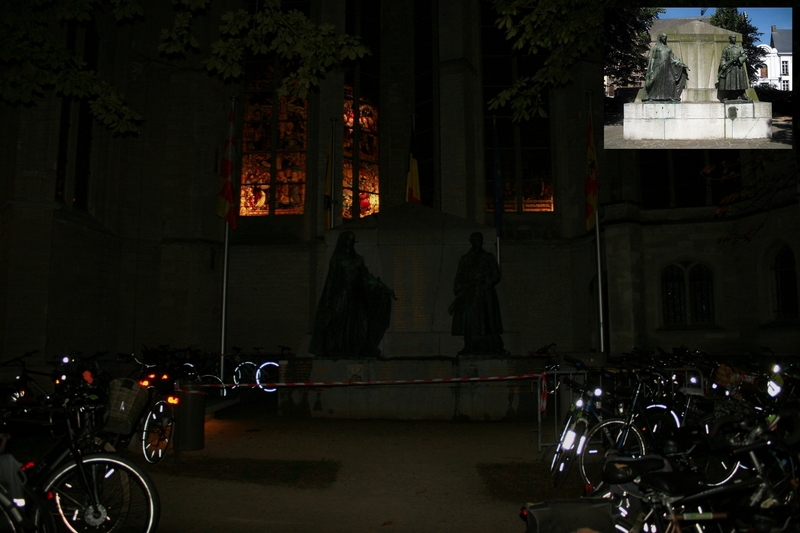 It’s nearing midnight in Mechelen, and thanks to some very kind locals, who didn’t seem in the least perturbed by my nocturnal mission, and despite the racket coming from a couple of deejays working a large stage set up in the square on the other side of the cathedral, and the accompanying crowds, armed police (searched twice betwixt hotel and cathedral), and a steward who allowed me in to what was actually a vast cycle park (below), I can show you a few shots of Mechelen war memorial, because, long-time readers won’t be surprised to hear, none of that was going to stymie this late night excursion. We’re some distance from our usual stamping ground tonight. 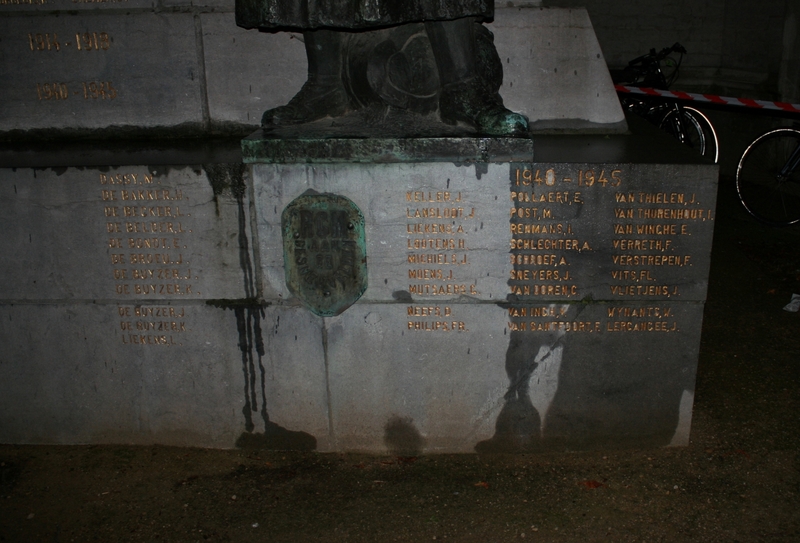 Mechelen today is a city of some 85,000 people, about seventy miles east and a little north of Ypres (Ieper), only a dozen miles south of Antwerp and the same distance north of the centre of Brussels, and I was there for entirely non-Great War reasons. 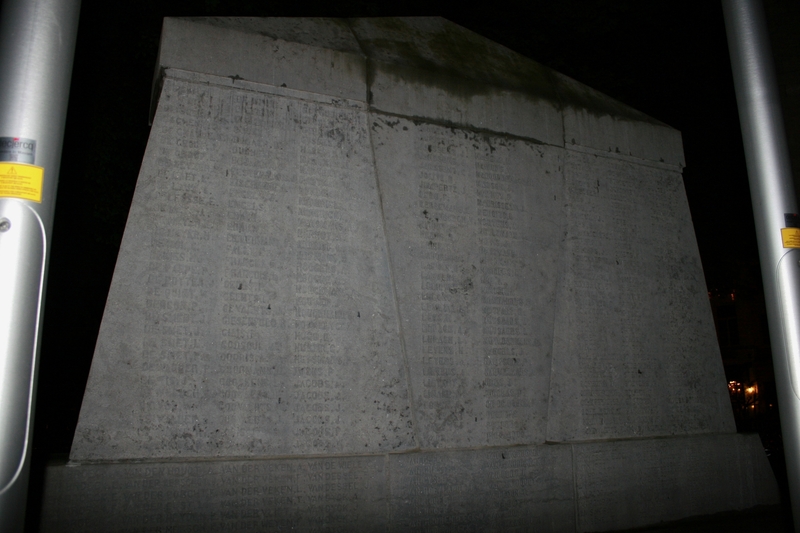 It was so dark in reality, and I only had a rough idea of where it was, that I walked past the memorial, fifty feet away, twice, without spotting it. In my defence it has actually been moved at some point from where I thought it was (inset), which hardly helped, but even so. I can spot a small piece of metal in a field, no problem, but I can’t spot a bloody great war memorial from fifty feet away! Thanks to the steward once again. 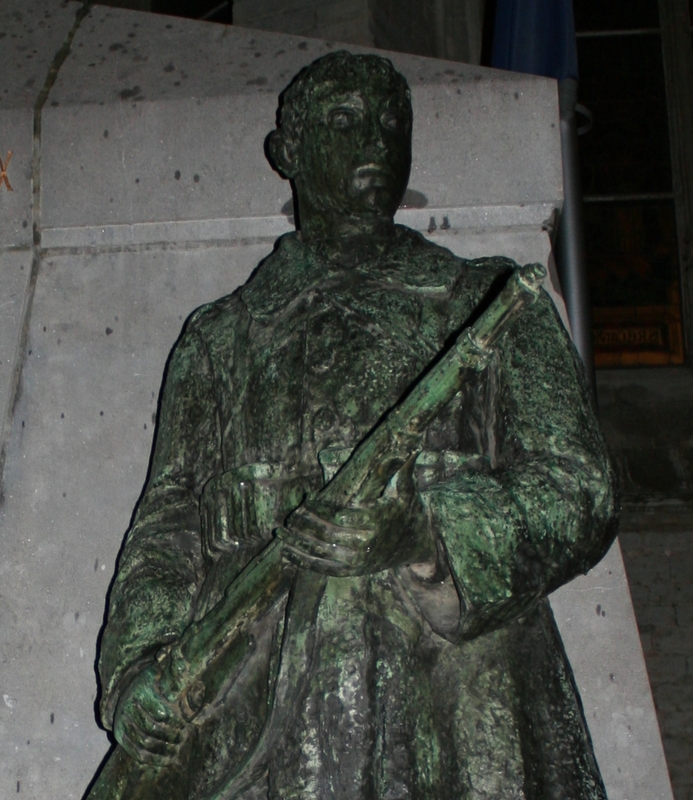 War first came to Mechelen (Malines in those days) on 24th August 1914, during the German advance towards Antwerp, German infantry attempting to storm the city, but in insufficient numbers to prevent the Belgian defenders from driving them back. A further attempt supported by artillery the following day was also rebuffed, before, on 26th, they succeeded, only for the Belgians to once more force them out. 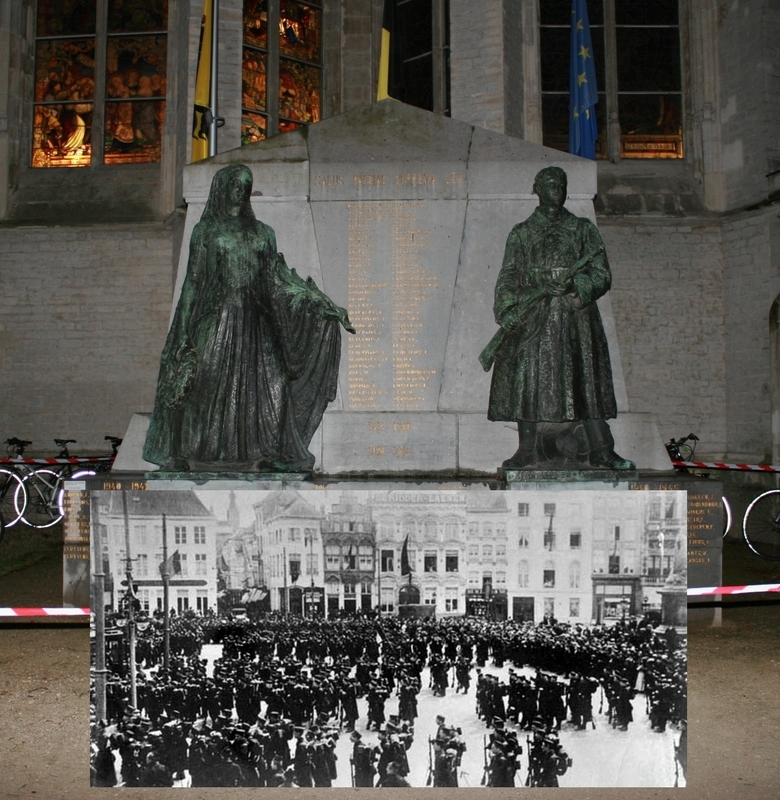 The inset above shows Belgian troops in the city square. Aarschot, fifteen miles east, was ordered to be razed to the ground and on 27th August, German commanders ordered the town of Leuven (Louvain) to be set on fire, destroying the world-famous library and the university, hunting down fleeing civilians and executing them. Throughout Belgium the fear of German occupation descended on the civilian population, and the exodus to the west began. Do not forget, dear BigNote reader, that German military strategy dictated a policy of terror towards occupied territories, the result of a deliberate policy decision by the German General Staff. 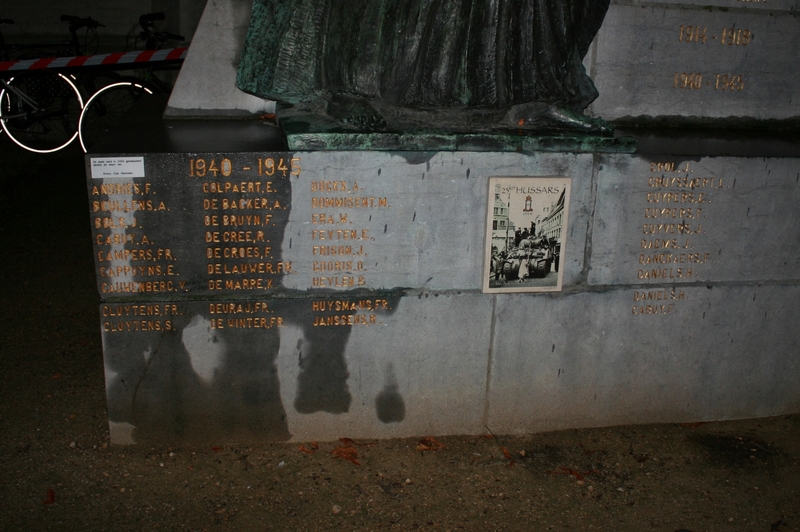 Most of the population evacuated Mechelen on 28th August, as did many of the Belgian defenders as the general withdrawal continued, but on 30th August the Germans, seemingly bent on taking revenge on the city’s ancient buildings for the rebuffs they had suffered, opened a bombardment which lasted until the following day and spared nothing, including the fourteenth century cathedral. 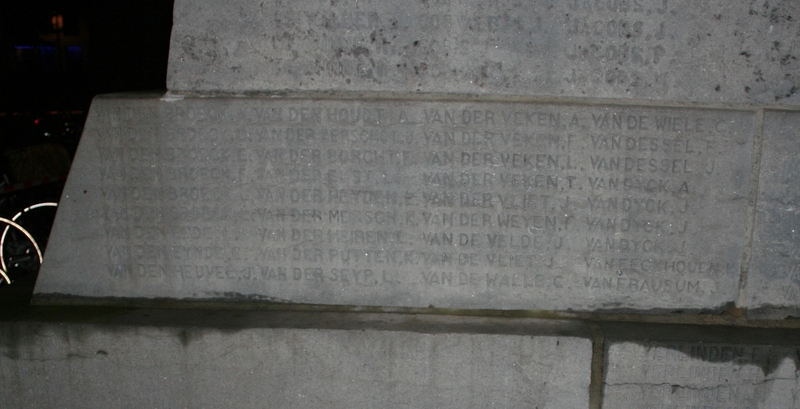 For reasons we need not go into here it would be another month before the main German attack on Antwerp would begin, but when it did, the main assault would come from the south east, between Mechelen and, eight miles to the north east, Leir. 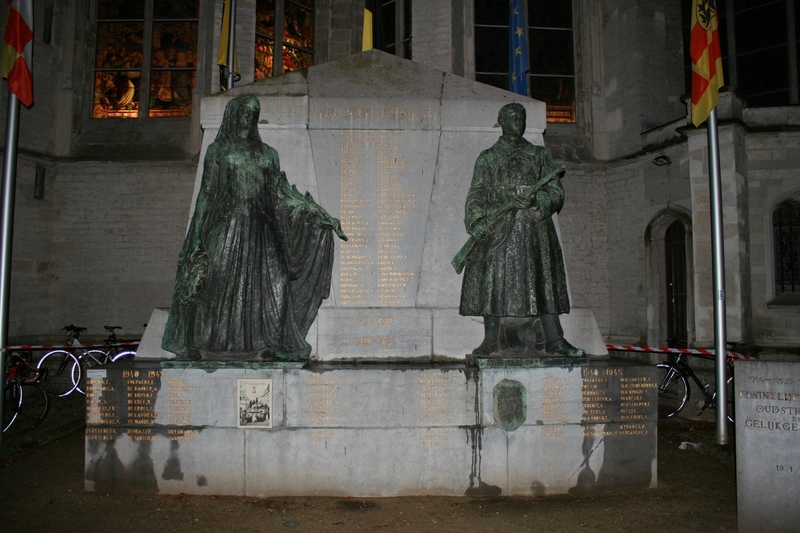 Despite having no military value Mechelen would be heavily shelled once more during the assault, the cathedral once again seemingly targeted, the remaining civilian population receiving no prior warning of the hurricane of fire about to be unleashed on them. The Germans would take the battered city and it would, of course, remain in their hands throughout the war. …almost invisible in the darkness, so much so that I failed to see them until checking the pictures on the camera screen. Seriously. These shots were made virtually blind, but they will do, I think. 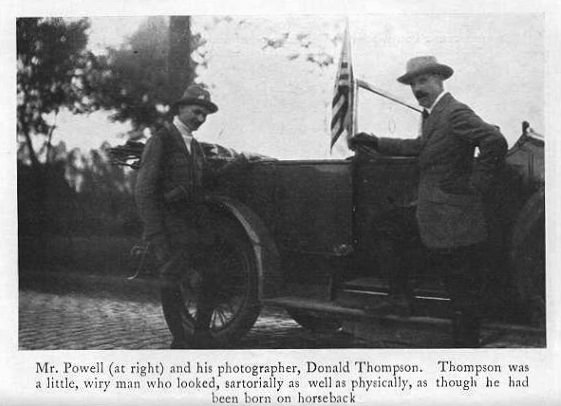 E. Alexander Powell was a war correspondent for the New York World who was in Belgium in 1914 when the Germans invaded. 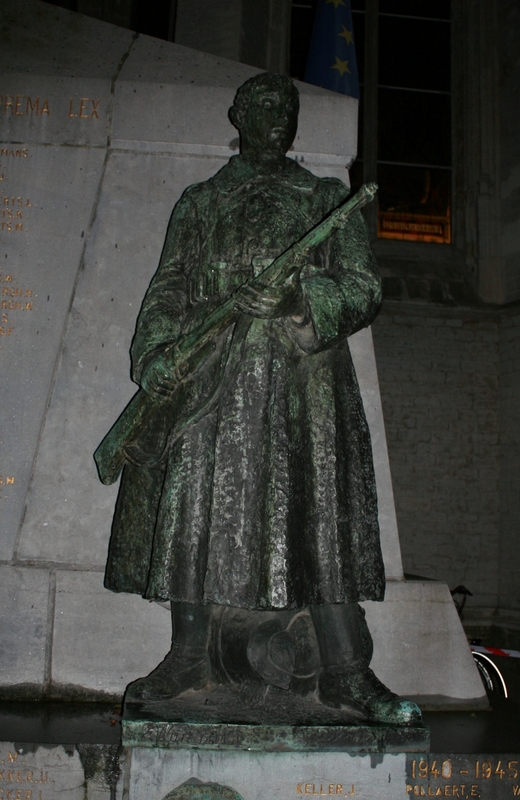 He witnessed and reported the retreat from Mechelen (Malines in the following account): “The retreat from Malines provided a spectacle which I shall never forget. For twenty miles every road was jammed with clattering cavalry, plodding infantry, and rumbling batteries, the guns, limbers, and caissons still covered with the green boughs which had been used to mask their position from German aeroplanes. Gendarmes in giant bearskins, chasseurs in uniforms of green and yellow, carabineers with their shiny leather hats, grenadiers, infantry of the line, guides, lancers, sappers and miners with picks and spades, engineers with pontoon-wagons, machine-guns drawn by dogs, ambulances with huge Red Cross flags fluttering above them, and cars, cars, cars, all the dear old familiar American makes among them, contributed to form a mighty river flowing towards Antwerp. 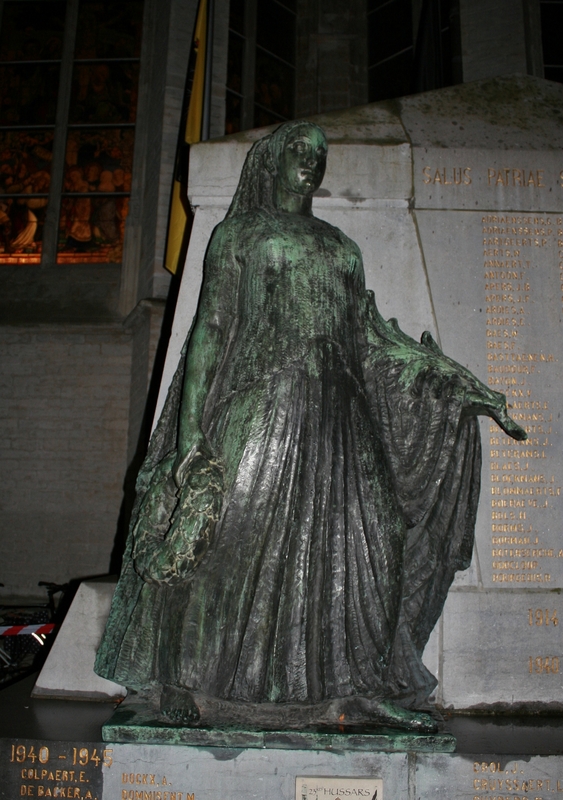 Malines formerly had a population of fifty thousand people, and forty-five thousand of these fled when they heard that the Germans were returning. The scenes along the road were heart-rending in their pathos. The very young and the very old, the rich and the well-to-do and the poverty-stricken, the lame and the sick and the blind, with the few belongings they had been able to save in sheet-wrapped bundles on their backs or piled in push-carts, clogged the roads and impeded the soldiery. These people were abandoning all that they held most dear to pillage and destruction. They were completely terrorized by the Germans. 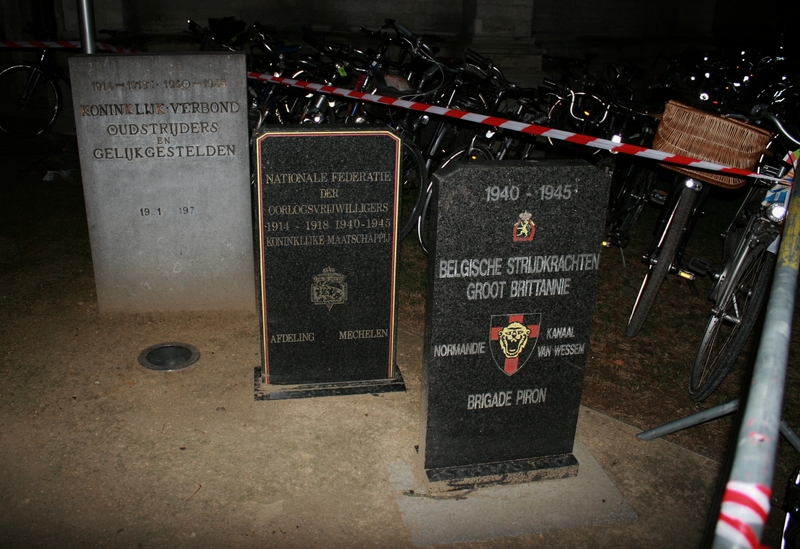 But the Belgian army was not terrorized. It was a retreating army but it was victorious in retreat. The soldiers were cool, confident, courageous, and gave me the feeling that if the German giant left himself unguarded a single instant little Belgium would drive home a solar-plexus blow. 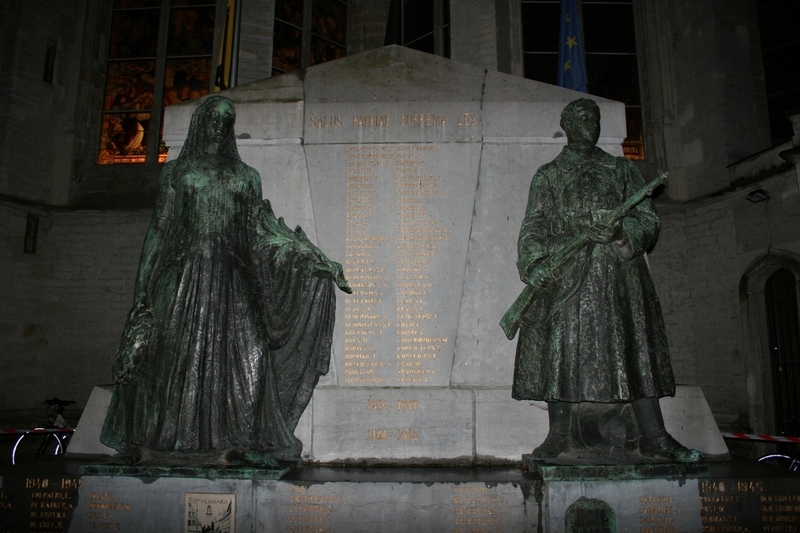 For many days after its evacuation by the Belgians, Malines occupied an unhappy position midway between the contending armies, being alternately bombarded by the Belgians and the Germans. The latter, instead of endeavouring to avoid damaging the splendid cathedral, whose tower, three hundred and twenty-five feet high, is the most conspicuous landmark in the region, seemed to take a grim pleasure in directing their fire upon the ancient building. The great clock, the largest in Belgium, was destroyed; the famous stained-glass windows were broken; the exquisite carvings were shattered; and shells, crashing through the walls and roof, converted the beautiful interior into a heap of debris. 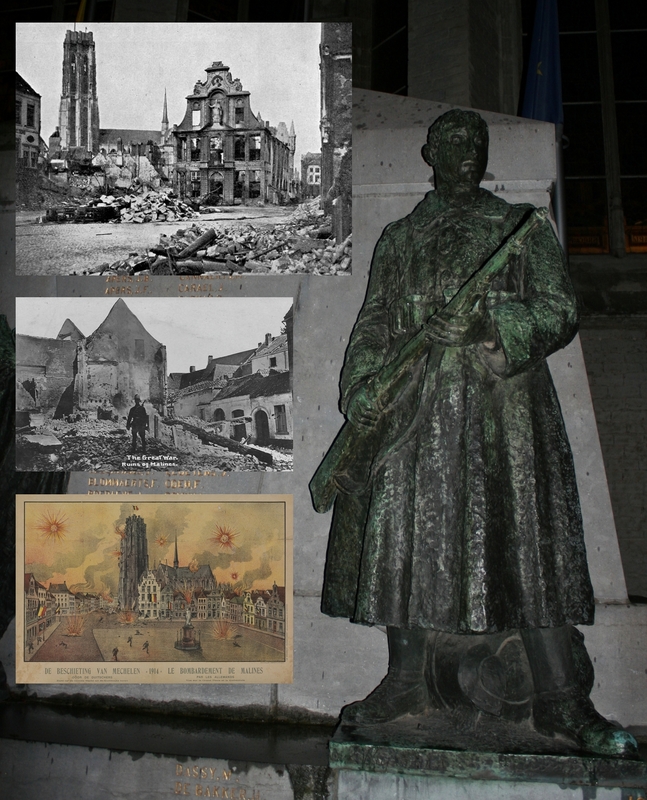 As there were no Belgian troops in Malines at this time, and as this fact was perfectly well-known to the Germans, this bombardment of an undefended city and the destruction of its historic monuments struck me as being peculiarly wanton and not induced by any military necessity. It was, of course, part and parcel of the German policy of terrorism and intimidation. 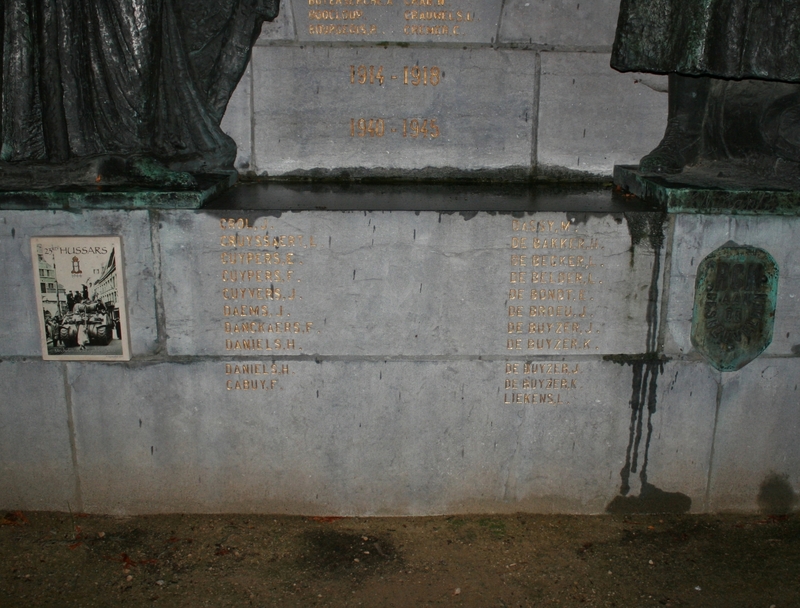 The bombardment of cities, the destruction of historic monuments, the burning of villages, and, in many cases, the massacre of civilians was the price which the Belgians were forced to pay for resisting the invader. 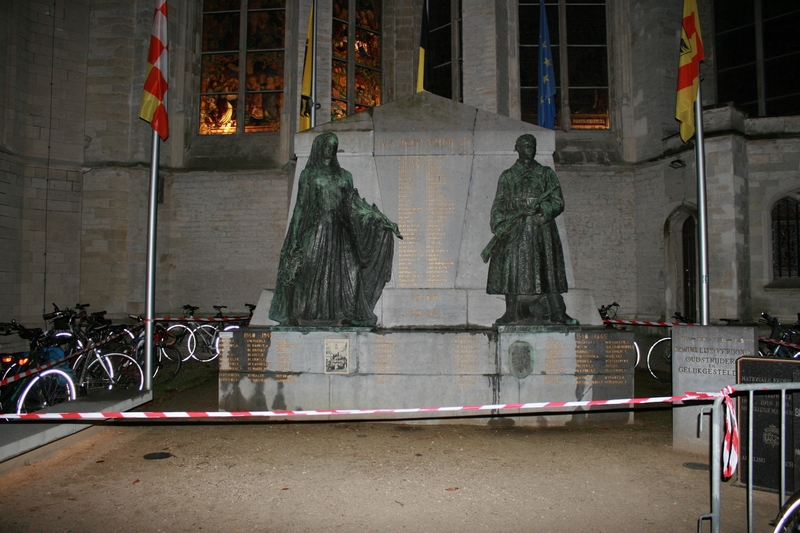 In order to ascertain just what damage had been done to the city, and particularly to the cathedral, I ran into Malines in my car during a pause in the bombardment. As the streets were too narrow to permit of turning the car around, and as it was more than probable that we should have to get out in a hurry, Roos suggested that we run in backward, which we did, I standing up in the tonneau, field-glasses glued to my eyes, on the look-out for lurking Germans. 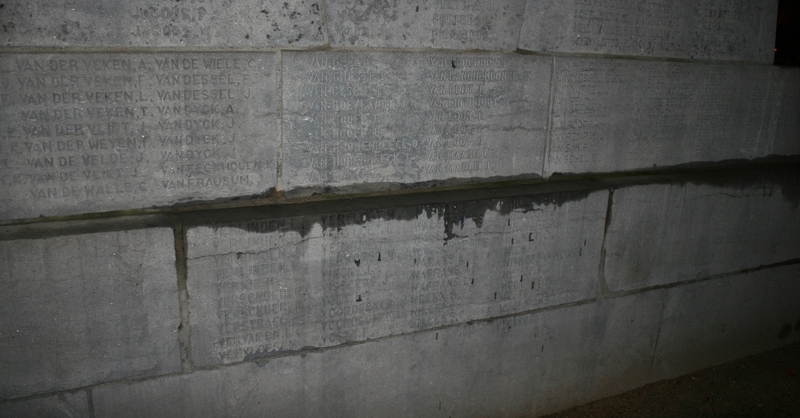 …although, a little confusingly, these two rows in the centre are a continuation of the Great War casualties, following on from the right hand column above them, and then continued on the back of the memorial. 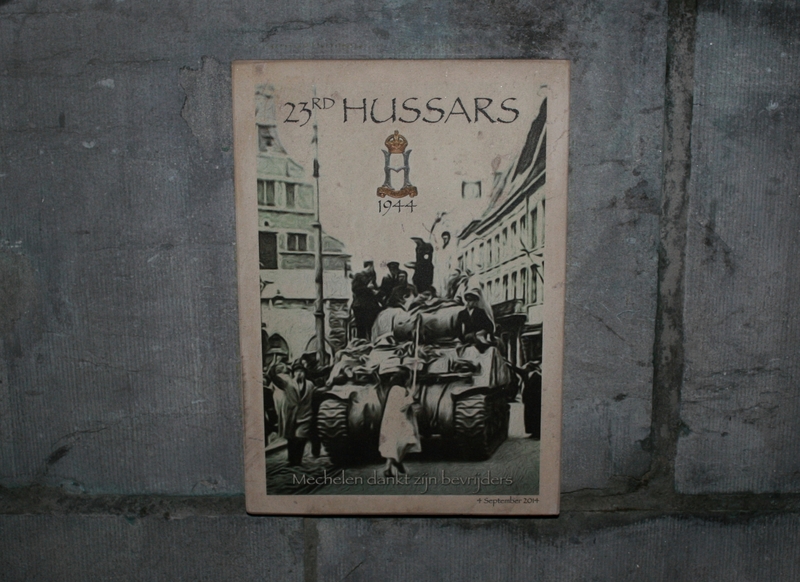 The city was liberated by the men of 23rd Hussars in 1944. You know the Germans’ terminology for the Sherman tank, I expect? They called it the ‘Tommy Cooker’. 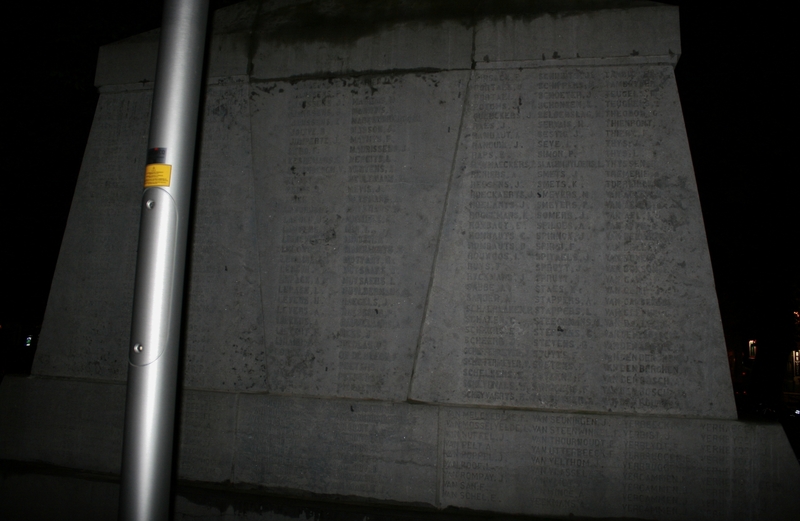 Before we leave Mechelen, probably never to return, even darker days would come to the city during the Second World War. Mechelen transit camp was a detention and deportation camp set up in the Kazerne Dossin military barracks in the city in order to corral and then transport Jews and other ethnic minorities out of Belgium, some to the labour camp at Heydebreck-Cosel, others directly to Aushwitz-Birkenau. 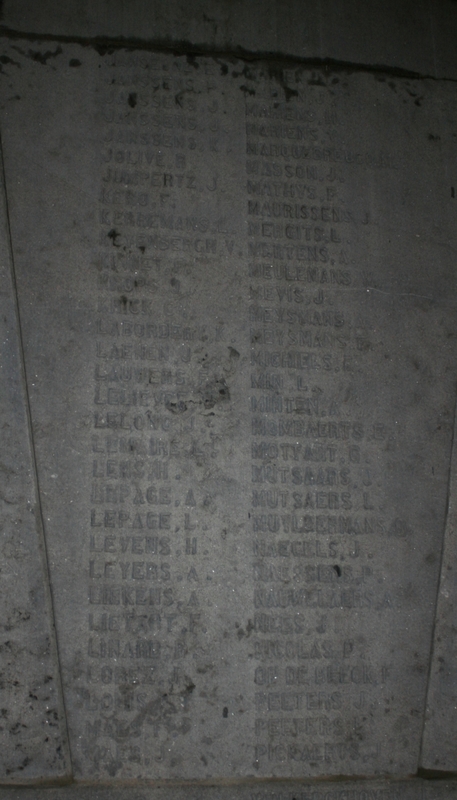 Between 4th August 1942 and 31st July 1944, twenty eight trains, carrying some 25,000 people, left Mechelen for the east. 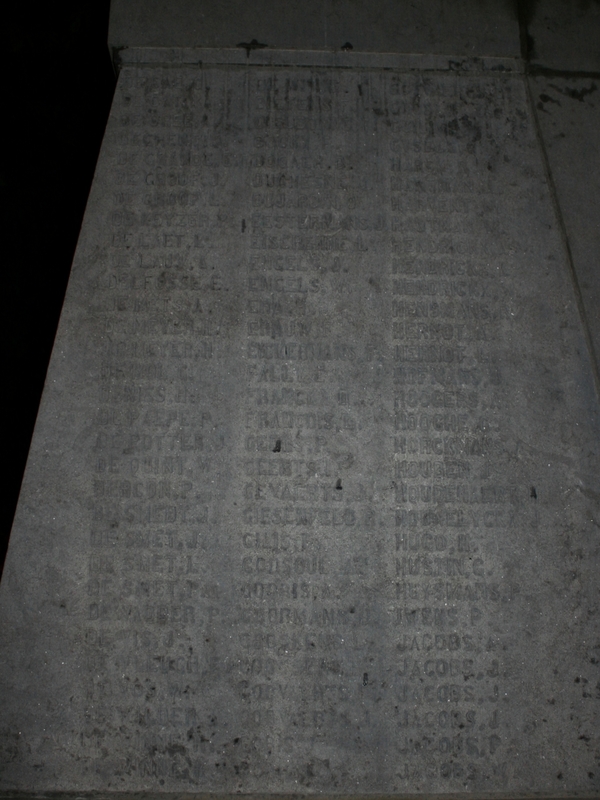 By the end of the war figures suggest that no more than 1,240 of them were still alive. 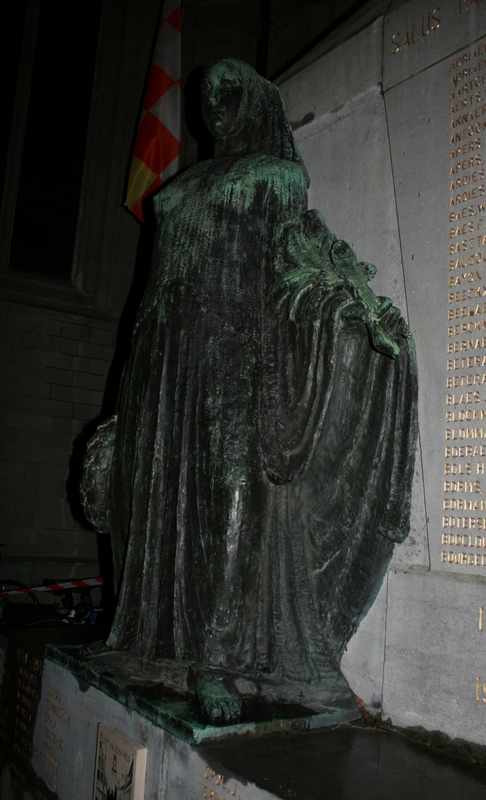 But, to finish on a more uplifting note, Cardinal Désiré-Joseph Mercier, Archbishop of Malines, became an inspiration not only in Belgium but internationally with his pastoral letter of Christmas 1914, ‘Patriotisme et Endurance’, urging the population not to give in to gloom and doom, and his staunch resistance to the German occupation. His influence throughout the Catholic Church meant that the Germans had to handle him with care, although the Pope appeared to give him little support; Mercier believed the war was justified to restore Belgium’s independence, the Pope preferring the view that the war was ‘this useless massacre’ that would result in the ‘suicide of civilized Europe’. 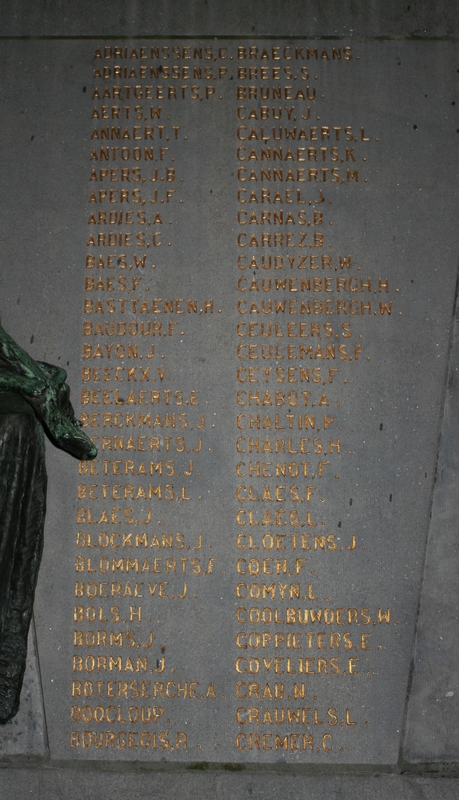 This entry was posted in Belgian War Memorials. Bookmark the permalink. Superb! 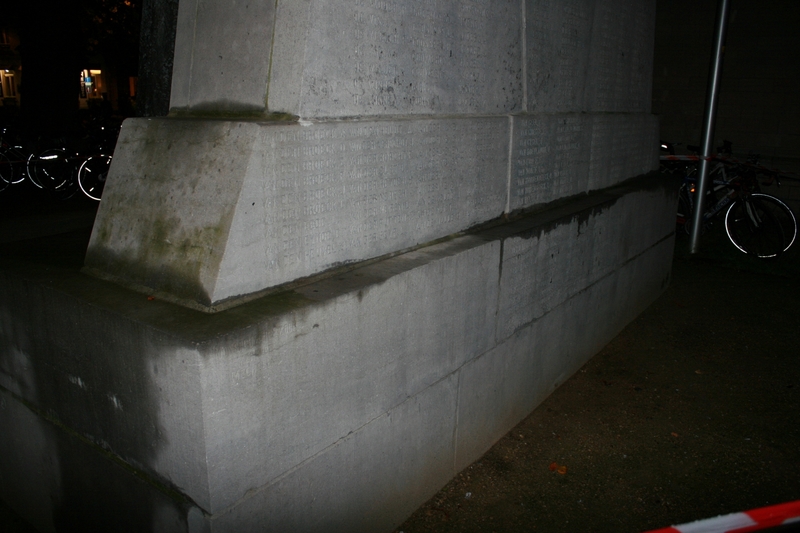 I’ve always felt that, for whatever reason, the figure of a woman on a war memorial has an extraordinary impact, and this is no exception. It’s a truly striking memorial! My maternal grandfather was in one of those ‘Tommy cookers’ during the liberation of Belgium with 3 RTR, and I’m very pleased to say that I have his medals, cap badge and a copy of their war diaries to prove it. He was injured in Belgium when his tank was hit and he was befriended by a local family, with whom he remained in contact until his death in the early 90’s, so Belgium will always hold a place in my heart. Funnily enough, the surgeon that operated on him in Belgium was originally from a village not twenty miles from where my grandfather lived in Derbyshire. It really is a small world. Another very enjoyable post Magicfingers, although the statistics are exceptionally brutal reading, even by Bignote standards! thank you. Wow, you are a veritable research machine at the moment Magic Fingers, thank you. Great story by Nick above too. What I love about this part of the world is the history (across many eras) but that perhaps the person on the street doesn’t see without a little digging, so easy to walk by. Mechelen like many European towns hides it’s ravages well to the modern eye. 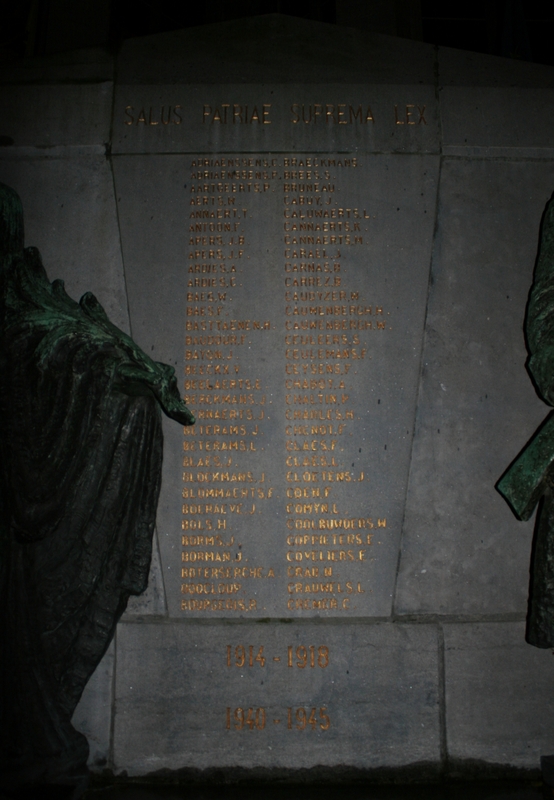 Hard to imagine the terror and uncertainty of just over 100 years ago that war brought to the civilian population. Although I guess a feature over the ages and still to be found in some places today. Certainly makes me consider my grandparents who lived much closer to the French border. Were their families tempted to join the long line of refugees? Or again like so many stay put and take their chances, which is ultimately what they did. The question always being which is best and what choice did many really have? As always the posts pose as many interesting questions. I am indeed. 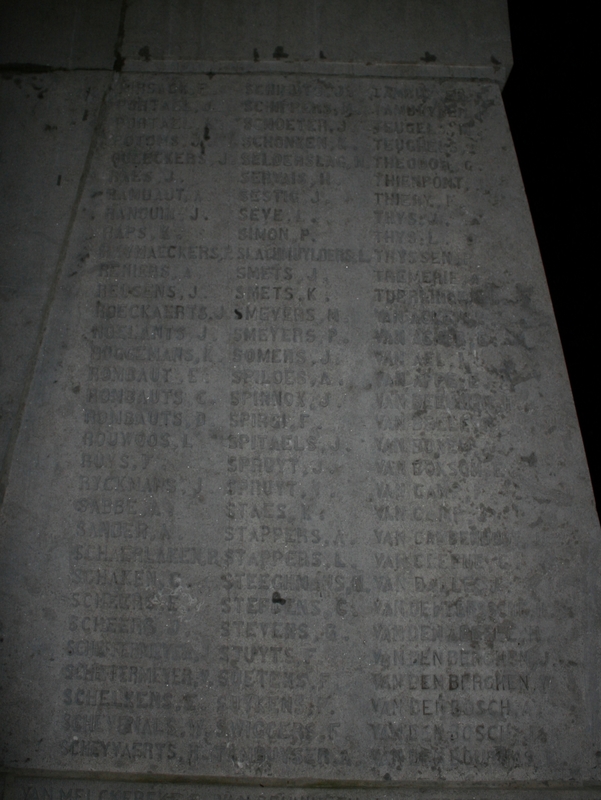 Actually I am kind of clearing the decks a little before we head off to French Flanders for a mega-cemetery tour. Once I start publishing it, the other posts I am drafting – and I am always working on several at the same time – will take a back seat for a few months. Baldrick is an example of what you are talking about – fifteen years ago he would travel to work past all sorts of Great War sites and cemeteries without ever giving them a second thought. Interesting about your Grandparents – I wonder what they did? Cheers Nick! 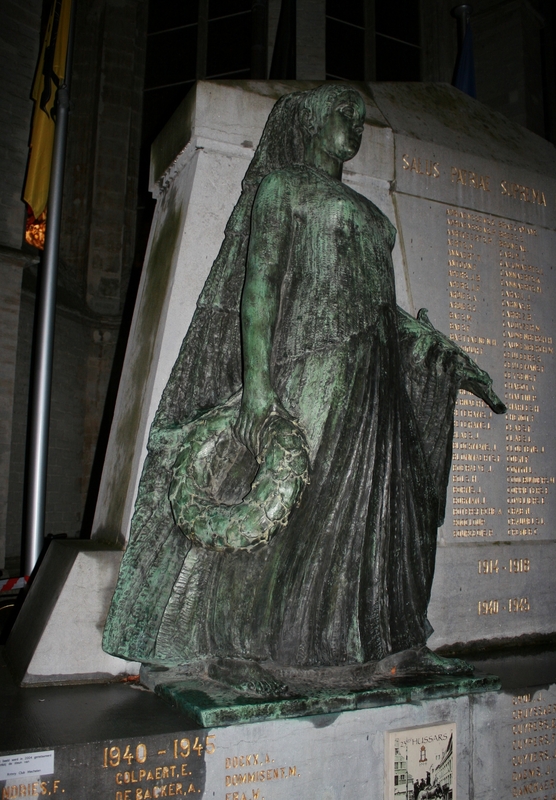 I agree with you – some of the most poignant memorials feature a woman on them. And a small world indeed! Good story. Another superb piece Magicfingers. Reading this one must have some sympathy with Sir Patrick Moore’s view that ‘the only good Kraut is a dead Kraut’! As you know my Great Uncle Lt.G.H.Frischling died fighting the Germans in the Great War and I have found at least another 18 Frischlings who went in through the gate and out through the chimney at Auschwitz in round 2, so I’m not a terrific fan of the master race! I an believe it! 18!! Speechless. Apart from, and apologies to our German readers, and there are, or have been, a few, a short story. Back in the late 70s I spent a couple of months living in the Sinai desert beneath the stars, as you do. I met a guy called Klaus, and if you remember the old 1960s b & w Robinson Crusoe on the telly (and if you do you are now singing the theme) he was the spitting image – anyway, he was a good man, but suspicious of his own countrymen. Occasionally when we would venture into populated tourist areas we’d be having a drink or meal or whatever and he would point out a nice late middle aged German couple and quietly whisper ‘Nazis’ to me. I bet he was right, too. We’re not immune here in Britain either, I’m sorry to say. Just one example, Stephen Christopher Yaxley-Lennon . . . .
Whoops sorry! Hadn’t thought of that – can’t be too careful nowadays.